Once upon a time (actually, it was 1909), there was a French Pastry Chef with a little shop on Rue Bourdaloue in Paris. We can assume he made an assortment of treats and sweets. But his big hit was a Pear and Almond Tart that was so popular, it was named after the tiny street. 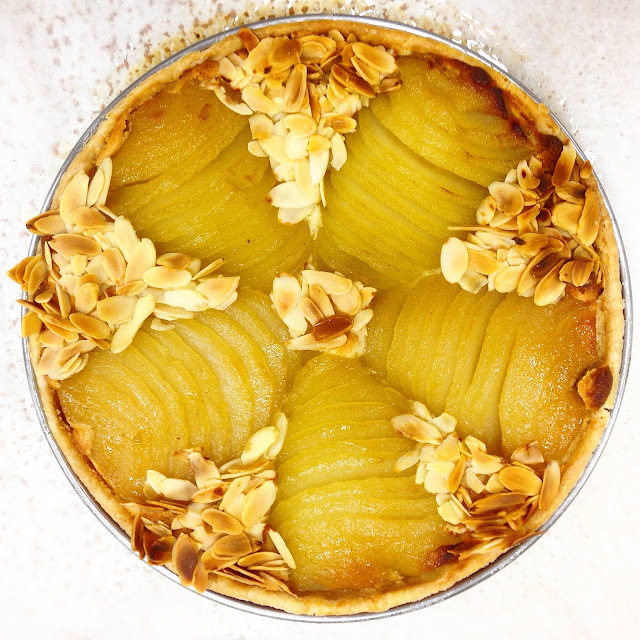 The subject of over a hundred years of riffs and reinventions, the Tarte Bourdaloue is traditionally a basic Pastry Dough filled with an Almond flavored cream and topped with Pears. 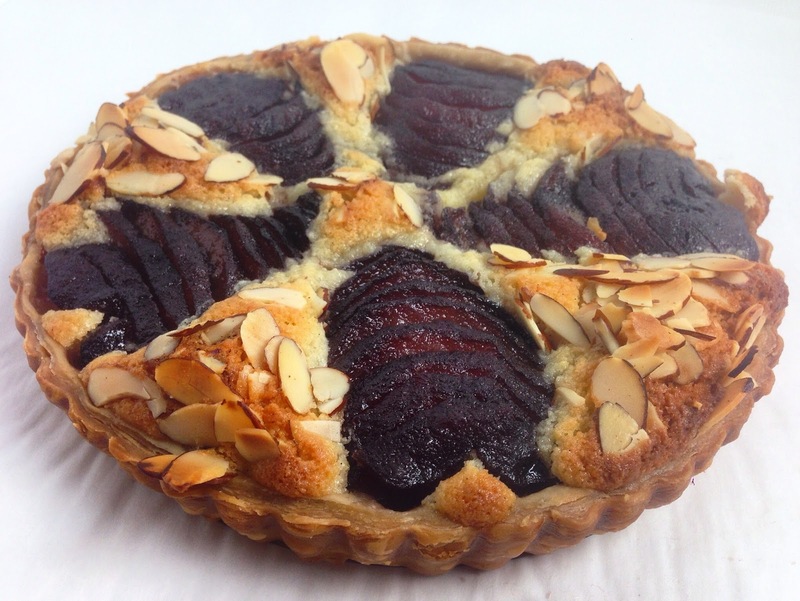 The Tarte Bourdaloue endures as a bit of a Culinary School Classic because it highlights several basic recipes and techniques: preparing and rolling Pastry Dough, making Almond Cream, poaching fruit and assembling a decorative Tart. But it's much more than an academic exercise. Particularly in the cool Fall months, a slice of warm Almond Cream and Wine Poached Pears is particularly irresistible. 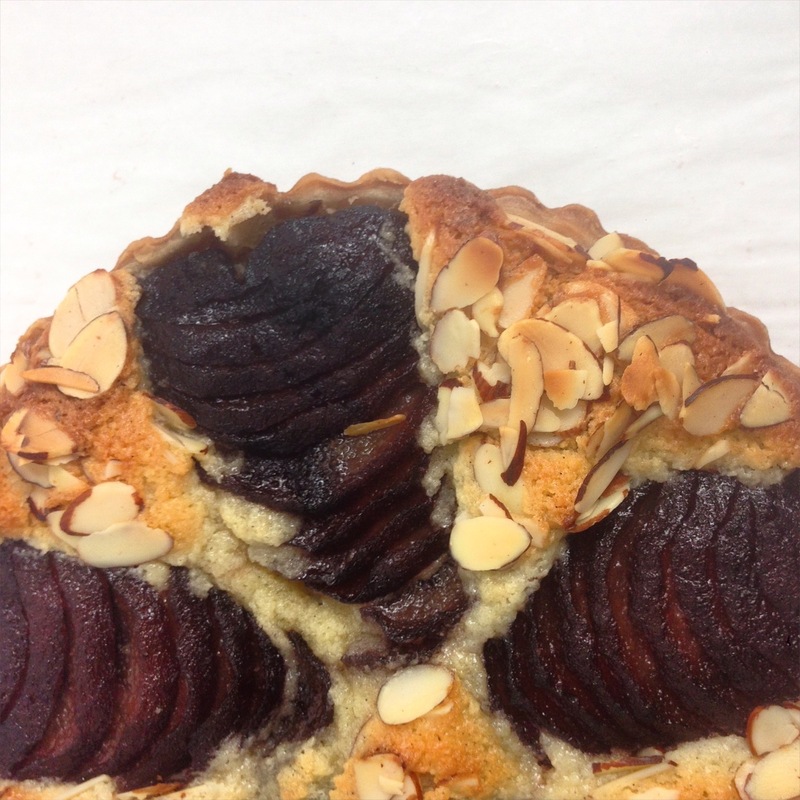 The Tarte Bourdaloue has three primary components: Spiced Wine Poached Pears, Almond Cream and (if you do things my way) Puff Pastry. It is best to poach the Pears at least a day in advance. At the very least, the Pears should be completely cool when you assemble the Tart. Since Poached Pears keep extremely well when stored in the refrigerator in a container of Poaching Liquid, you could even prepare them up to a week in advance. 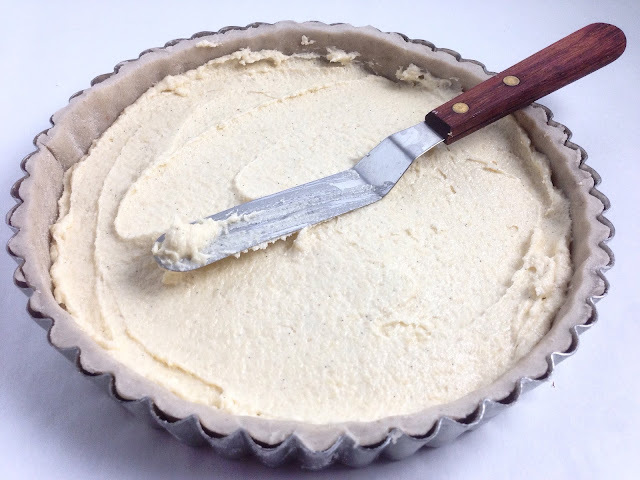 A Tarte Bourdaloue is traditionally prepared with a sweet Pate Sucree or Flakey Pate Brisee. Tradition is fine, but I use Puff Pastry whenever possible (I'm extremely predictable). Prepare your dough of choice, letting it rest and chill before rolling. When the Pastry Dough is ready, roll it into a circle approximately 10" in diameter and between 1/8" and 1/4" thickness. Line a tart mold and let the dough rest and chill for 30 minutes before trimming the edges with a sharp paring knife. 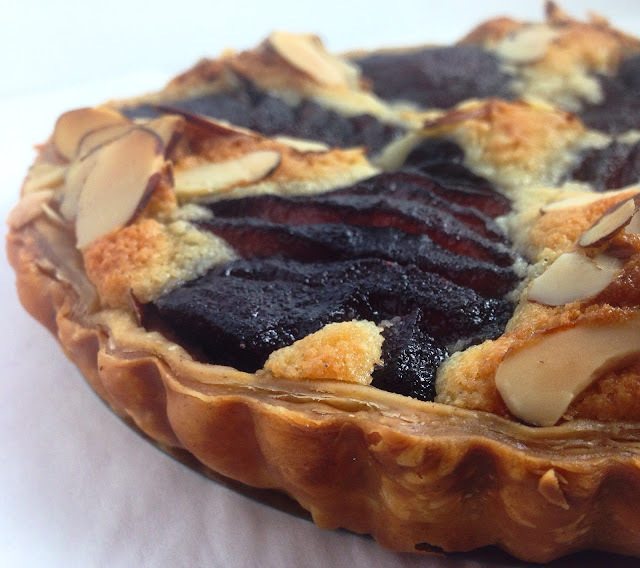 The Tart is first filled with a layer of Almond Cream (Crème D'Amandes). Use an offset spatula to spread the Almond Cream into a smooth, even layer. Do not overfill the Tart. Almond Cream rises when baked and can easily spill over in the oven. 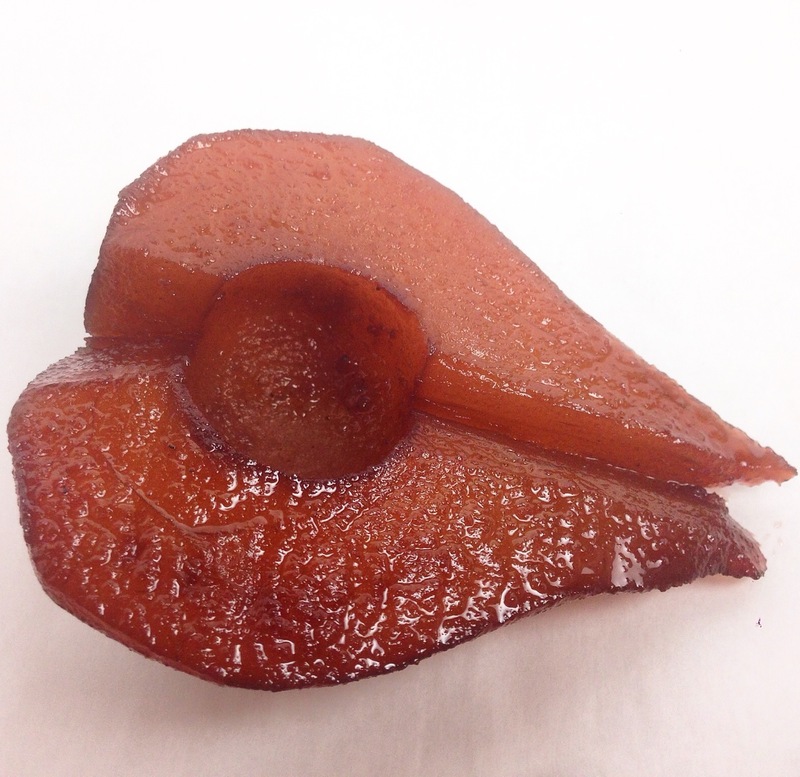 Once they are completely cooled, cut the Poached Pear halves into slices approximately 1/4" thin. 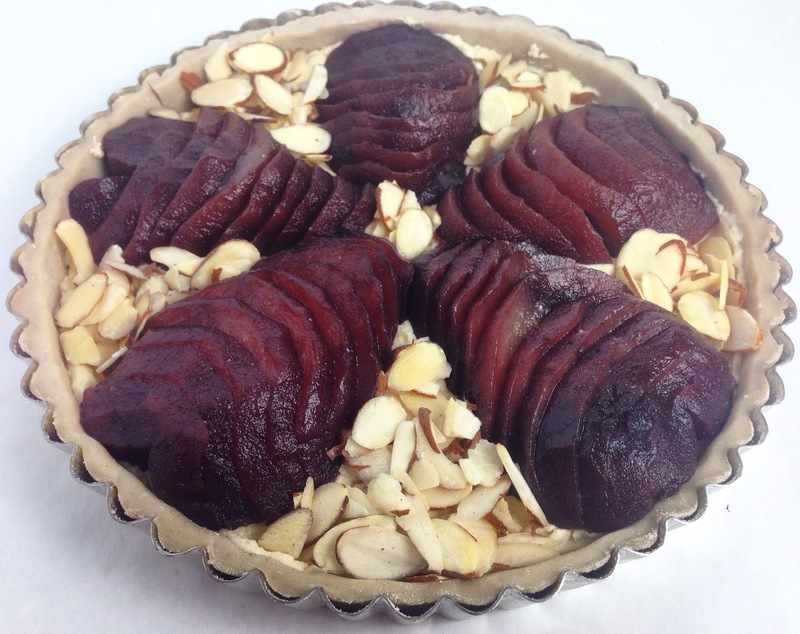 Arrange five sliced Pears halves evenly around the Tart on top of the layer of Almond Cream. Place the Pears so that the thinner top (the stem) is pointing towards the center of the Tart. Fan the slices in towards the center as well. Fill in the exposed areas of Almond Cream with Raw Almond Slices. The Almond Slices hint at the Almond Cream hiding below. It is important to use Raw Almond Slices. If the Almond Slices have already been toasted, they will burn in the oven. Bake the Tart at 350 degrees Fahrenheit (177 degrees Celsius) for 40-50 minutes. The Almond Cream will rise as it bakes, filling in the areas around the Pears. The Tart is done baking when the Almond Cream is set but still soft and not raw. The Pastry Dough is should be golden brown and baked through. The Almonds should be toasted by not burned. The Tart is best served the day it is baked, but it will keep for 2-3 days when refrigerated in an airtight container. Temper the Tart before serving. The unbaked Tart can be refrigerated for 2-3 days or frozen for a couple of weeks. 2. Prepare the Pastry Dough. Allow the dough to rest and chill for at least 30 minutes before rolling. 3. Roll the Pastry Dough into a 10" circle between 1/8" and 1/4" thickness. Line a tart ring with the dough, and let the dough rest and chill before trimming the edges with a sharp paring knife. 4. As the Pastry Dough chills, prepare the Almond Cream. 5. 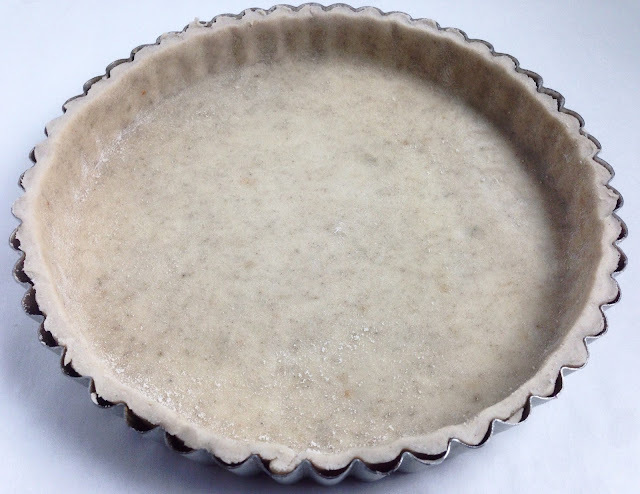 Remove the Pastry Dough from the refrigerator and trim the edges of the tart mold. Fill the Pastry Dough with a smooth, even layer of Almond Cream. 6. 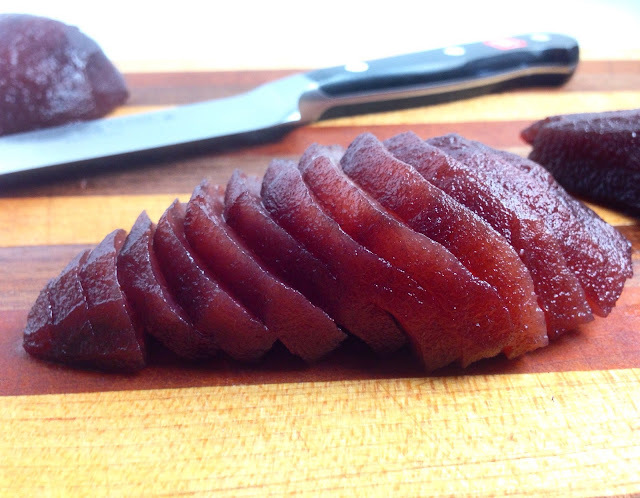 Remove the Poached Pears from the Poaching Liquid, allowing any excess Poaching Liquid to drip off. Cut the Pears into 1/4" slices. 7. Arrange the five Pear Halves on top of the Almond Cream, placing the pears with the thinner tops (the stems) pointing towards the center of the Tart. Lay the slices so that they fan inward towards the center of the Tart as well. 8. Cover the exposed sections of Almond Cream with Raw Almond Slices. 9. Bake the Tart at 350 degrees Fahrenheit (177 degrees Celsius) for 40-50 minutes. The Pastry Dough should be lightly brown, the Almond Cream should be soft but not raw, and the Pears should have just begun to caramelize. Allow the Tart to cool before serving. 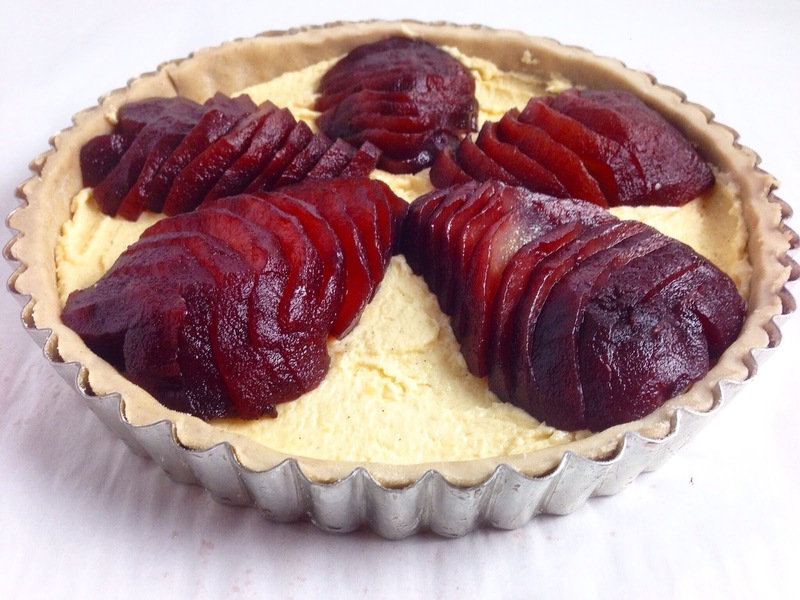 - The set but unbaked tart can be refrigerated for 2-3 days or frozen for a couple of weeks. - The baked Tart is best served the day it is baked. It can be kept refrigerated for 2-3 days in an airtight container, but should be tempered before serving.